Holy hell did the weekend freeze up on us, to the point where I thought we killed a witch somewhere in the hills and her spirit was exacting revenge on everyone in the town below. So, of course, the people who ventured out into Gallery Stroll this past Friday primarily stuck around the rooms that were warm until they could quickly dash to the next spot. 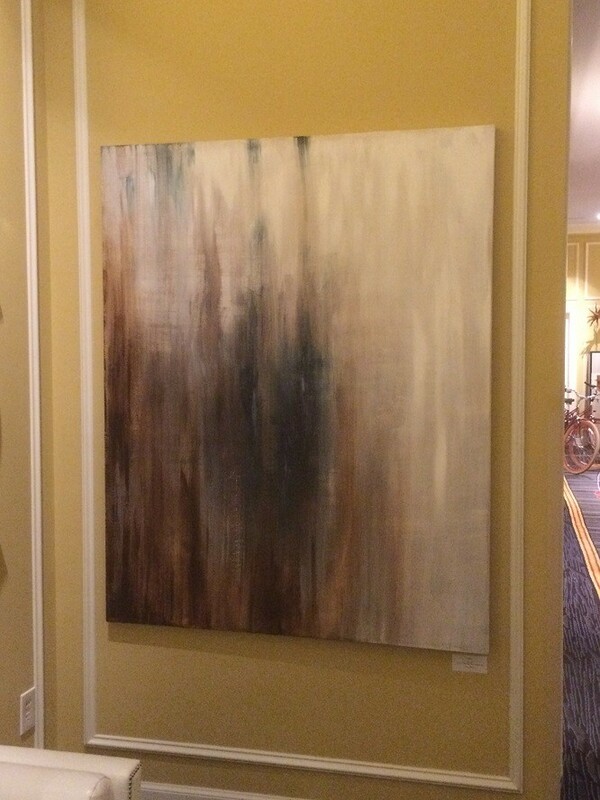 One of the best spots to stay with a roaring fire in the room was the Hotel Monaco, who have put local artist Ran Stewart on display in their living room. Today we chat with Stewart about his career and artwork, as well as being given the chance to be on display for the next few months at the downtown hotel. Gavin: Hey Ran! First off, tell us a little bit about yourself. 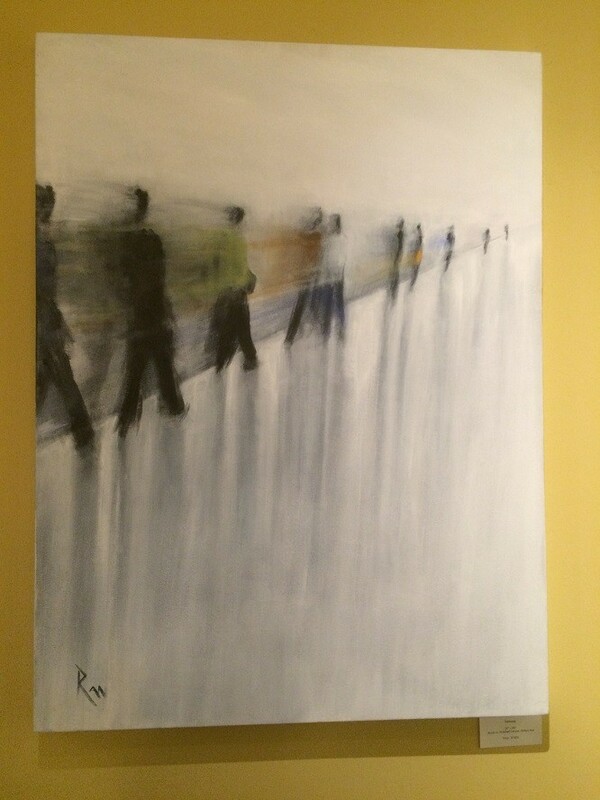 Ran: My name is Ran Stewart, I’m a local Utah artist. I’ve been painting since I was nine. I’ve always been engaged in the creation of art in some form or another. For many years I worked as a designer and art director for various software companies and although I still do some consulting here and there the past five years I’ve been devoting my time almost entirely to fine art. Ran: I’d have to say I’ve always been interested in art. In many ways, I think we are all creators and of course as a child I loved crayons and paper and occasionally drawing on the walls, much to my mother’s frustration. I have several aunts and uncles that are artists so I think the inclination runs in my veins. As far as influence, I’ve always been drawn to the impressionists, my early work was very much influenced by Turner and the Hudson River School movement. The use of a very limited palate and a focus on light has always been very core to my work. My newer work of course has taken a very seemingly different approach but the simple lines, limited palette and impressionist spirit is woven into every brush stroke. Gavin: What was it that drew you toward painting above anything else, and how did you get started at age nine? Ran: I’ll admit I’m just a bit ADD, so I’m always exploring various media. In addition to painting, I also do a sculpture and digital art as well. I’ve been more prolific as a painter, however; it is my go to medium as a means of escape and meditation of sorts. Even when I am working on a sculpture I turn to the canvas to solve design problems, to explore the piece and find the lines. When I was a young boy my parent’s got me a paint by number set. After a few minutes of following someone else design, I decided to just do my own thing. It turned out surprisingly well. In fact my grade school art teacher was so taken by it, she had it entered in several state art shows and fairs. Beginners luck perhaps? Gavin: What was the process like for you in honing your skills over the years before even reaching college? Ran: Mine has been a meandering path of sorts. When I was young I was very fortunate to have great teachers and family that supported me as an artist. I was called on often to create drawings and paintings for various groups and clubs. In high school I was equally focused on art and theatre set design. In fact, I had to choose between Theatre and Art for the Sterling Scholar competition and wound up choosing Theatre because I enjoyed designing sets so much. In college, I actually didn’t take many art classes. My parents and others urged me to get a “real degree” to fall back on. Ironically to put myself through school I was actually the art model for many of the classes at Utah State. Which was great, I got to hear the lectures and be part of the art process. It was very educational, and I got paid to do it. Since college, I've worked as a graphic design, art director and consultant. I’ve dipped my toe in and out of the water of fine art many times. I’ve always painted and created at times just for own sanity and others with the clear intention of doing it as a professional. It’s only been in the past few years that I’ve allowed myself to accept the mantle of artist and do it full-time. Gavin: Looking at your degrees, it appears you have nothing art-specific for any of your degrees. Did you study art at Utah State or Full Sail at all, or were you mainly getting degrees in areas for a career outside of art? Ran: I actually had no less than eight majors in college; from theatre design, speech and debate, psychology and engineering to name a few. Some say ADD, I just say I’m very curious about many things! I used college as a sort of playground to explore things that interested me. Art included. In the end I think USU was just sick of me taking classes and handed me a degree so I’d move on. At Full Sail I focused on New Media Design but the emphasis was focused on marketing and commercial design. The great thing about a diverse education is, you get to see things from many different perspectives. Although I regret not having taken more art classes when I was younger, I feel my life has been very much enriched by the things I have studied and they all contribute to my vision as an artist. I’ve always felt the true education as an artist, or in any field is our day-to-day exploration and continuing education. Ran: It goes real fast. It goes real slow and then fast again. For me, creating is this very erratic process. I’ll see something and get inspired. It will just flow out of me for a time and then suddenly it’s horrible, everything I do begins to ruin the piece. I have to put it away and let it rest for a time. Then I’ll be working on another piece and suddenly I’ll think about that sad neglected work in the corner and inspiration strikes and I find it’s voice again. This process can happen over a few days or weeks. And sometimes years. I had a piece I started on New Years day 1999, I finished it on New Years day 2009. Granted I never actually feel like any piece is done. At some point, I have to sign it and get it out of the studio or I’ll keep tinkering with it. Even now, I’ll see a painting I did years ago and think, maybe I should grab some paint and fix that one little thing. Collectors aren’t very keen on your coming in and messing up the piece they bought so I have to resist the temptation. 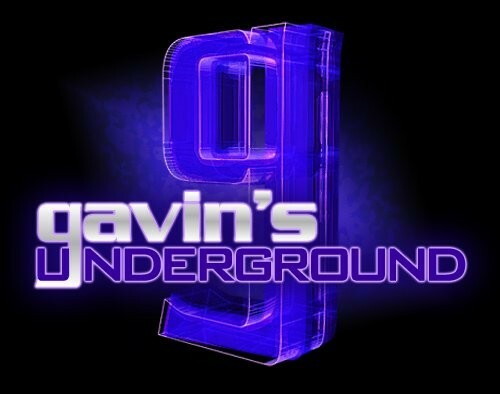 Gavin: Do you play around with your creations a lot or do you tend to stick with whatever came to mind? Ran: Every painting and every sculpture is a series of a thousand decisions. Each decision changes the destiny of the piece. I’d say less than 10% of my finished work comes out exactly as my original concept. I often rely on serendipity to guide me. It is quite often the mistakes I make that provide the greatest inspiration. In fact, when a piece completely flows out unhampered, I often question it, was it too easy? Did I challenge myself? Gavin: A lot of the work I've seen from you has either been landscape or modern, with your own twist on the design. What drew you to those two areas most and why do you like painting them? Ran: As I’ve mentioned I was very much influenced by Turner and the Hudson River School. They are moody landscapes that focus on the use of light to create moods and set tone. I’ve always loved the outdoors, the flow of light through trees particularly move me. Much of landscape work has centered around that magical play of light. My landscape work was always a kind of escape for people to hang on their walls. My current work has taken a modern twist due in part to my own changing aesthetic but also due to the process. This current work is inspired by the blurred motion. I love taking scenes we see every day; people in a mall, a train rushing by, people rushing to get out of the rain, and capture that moment and make it beautiful escape. That seemingly mundane takes on a higher meaning when the story is put on canvas. Gavin: You also dabble a little in figure work and sculpture. Are those more experiments for you, or are they areas you genuinely wish to do more in? Ran: In truth it’s all an experiment of course. The figure work is perhaps ingrained from all those years as an art model. Sculpture is a newer passion of mine. It allows me think and create in a very different way than painting. And as you’ve probably gathered, I’m not one to focus on a single thing for long. My brain is constantly teaming with new ideas and ways to explore different media. We live in an age where we are supposed to specialize, but I find my mind is more attuned the time of the renaissance. I believe we are here to learn, to create, to explore, and the art work created is a wonderful by-product that I can share with others. In essence each piece is a map of my journey and I intend to travel the world. 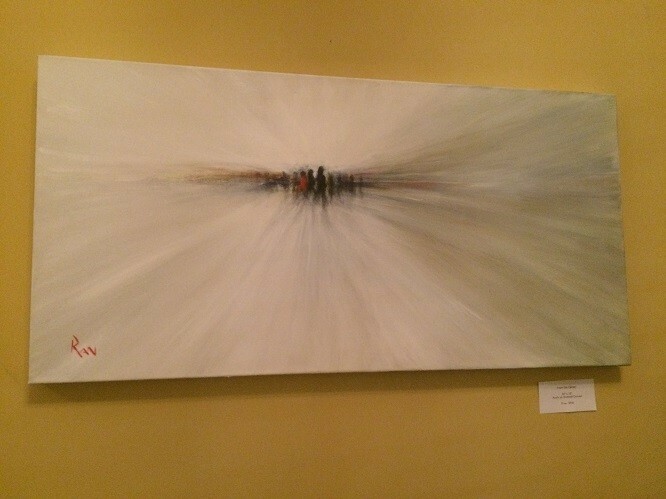 Ran: The body of work on display at the Hotel Monaco is all part of my recent work that revolves around movement. Each piece begins with snapping photos or taking simple videos with my cell phone. From there I overlay the frames and then paint my impression of that. In a way it’s like capturing a segment of time in a painting. It’s a way to tell a simple brief story on canvas. On display are a variety of scenes, lonely alleyways, people rushing to a train, water cascading off rocks. I use a very limited palette and explore a high contrast and light, simplifying the moment to it’s core design. Gavin: How did the opportunity come about to be displayed at Hotel Monaco, and how has it been for you working with them? 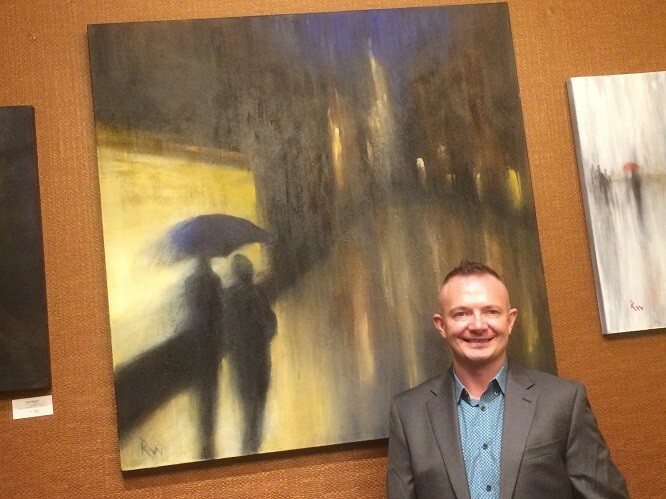 Ran: Shawn Jackson, sales manager for the Hotel Monaco attended one of the Studio Open House’s I host every few months. He and I spoke about a new program the Hotel is doing to feature local artist. Additionally Shawn and the Hotel Monaco put together a fundraiser called the Pink Party that benefits the Utah Aids Foundation. So this four-month-long show will culminate with me donating a large original piece created specifically for the fundraiser. It’s a fantastic opportunity for me and a great way to give back as well. Working with Daryn the General Manager, Shawn and all the staff at the hotel has been amazing. They are very supportive and accommodating. I’ve popped in to see how things are looking and am always delighted to have someone from the hotel tell me about how a guest fell in love with this piece or raved about that piece. It’s very gratifying. Gavin: What do you find about the space that's most appealing, both as an artist and a spectator? Ran: So often when you see artwork in a gallery, it is hard to imagine how it might look in living space. The Hotel Monaco is this wonderfully eclectic space that makes you feel suddenly at home the moment you walk into the lobby. There are great nooks and spaces to hang the art that make you feel like it could be in your home. 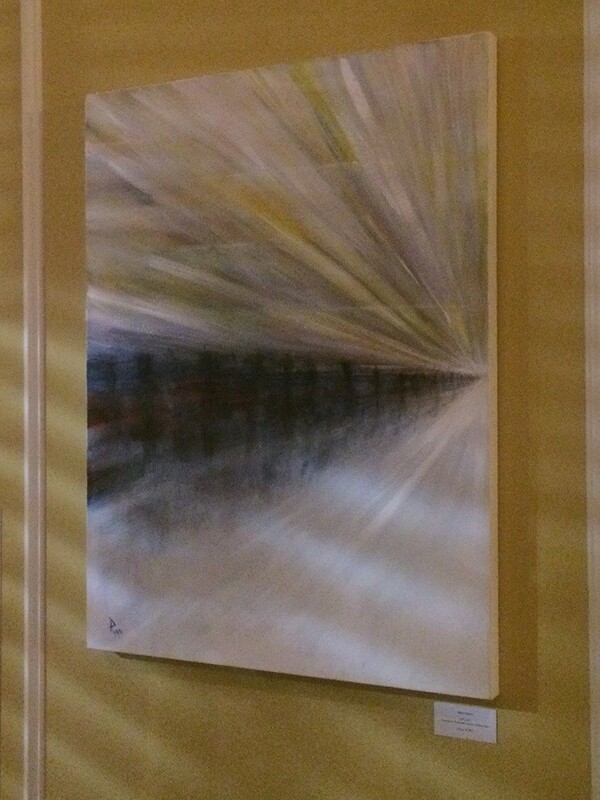 In many ways, I think it gives the viewer a sense that this art is real, tangible, not hanging in a museum. 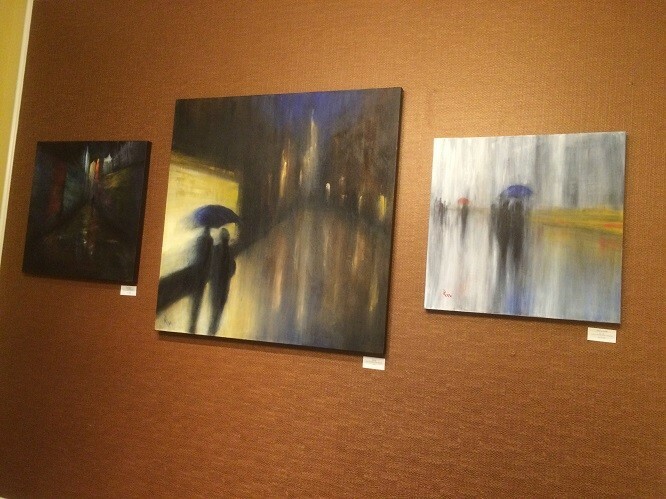 As an artist, I love to see how my work looks in different environments. 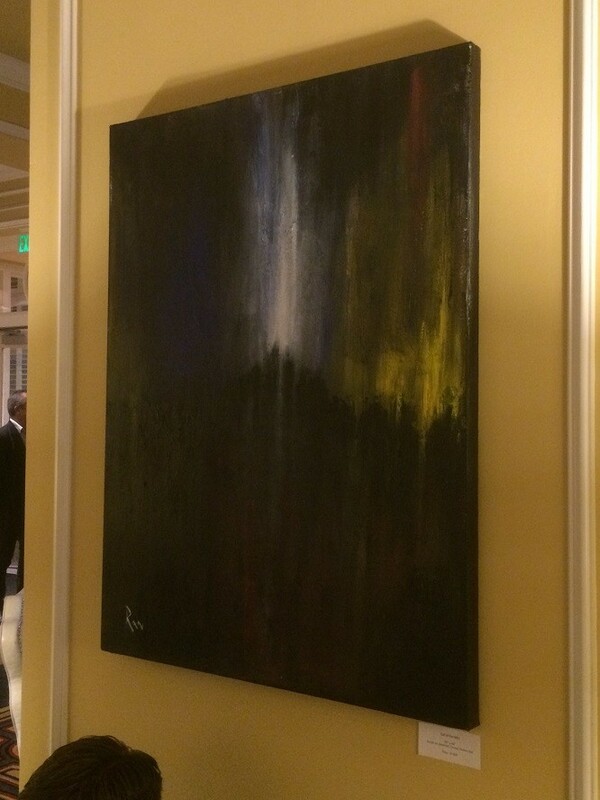 And let's be honest, to get to hang your work for an extended period of time in one of Salt Lake’s finest hotels is an honor and a spectacular opportunity. Gavin: What are your thoughts on the current state of the SLC art scene? Ran: Salt Lake has always had this wonderful underground vibrant art scene, we have a lot of great talent, the challenge is creating opportunities for artist to show their work. 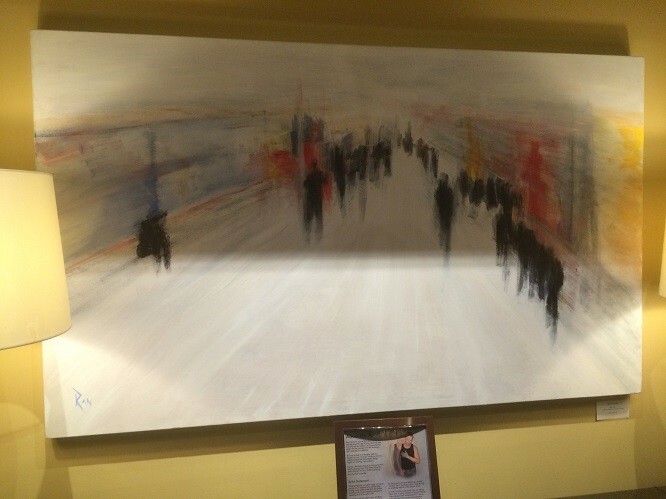 That’s why I really applaud the Hotel Monaco, I think it shows great vision to invite local artist to show in their lobby. It gives their guests and visitors a taste of the local culture, it gives artist access to a vast audience they may not reach typically, and it's such a great way to engage with the local community. Gavin: What's it like for you to take part in Gallery Stroll, and what do you think of the organization and their work? Ran: The Gallery Stroll has always been this great tool to bring people into galleries that may not typically take time to stop in. Creating an evening event pulls together a great social experience and a chance to meet artists and see new work. I’ve always said buying art from an artist you’ve met and connected with adds so much to the experience of hanging the art on your walls. Gavin: What else do you have planned over the rest of the year? Ran: I’m in the process of finalizing several exhibitions in Washington DC and LA later in the year. I’ll be doing several Open House’s at my studio throughout the year as well as a few outdoor shows to highlight some of my new sculpture work. This year has also brought in a lot of commission work as well, so I am devoting a lot of time completing those pieces of work. The show at the Hotel Monaco has only been up for a few weeks but I’m already getting a lot of attention from it, so I think this show will lead to more opportunities to show here in Salt Lake.